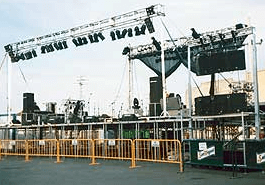 In 1980 VMB started to manufacture its first lighting dimming systems for the entertainment industry. Thanks to a reliable and parasite-free regulation, the VMB Touper KW analogical dimming packs gained the professionals’ recognition. Their continuous omnipresence on stages demonstrated their extraordinary efficiency and strength earning a deserved prestige among the professionals of the sector. Nowadays, DS Pro and DS Stage Dimming systems, which are entirely based on a digital technology, are the result of a great experience that can be witnessed in all of their advanced performances. VMB supply a range of Towerlift equipment in various sizes and weight ranges, for further information see the relevant pages.